The village of Cairndow lies in a lovely setting at the head of Loch Fyne near the mouth of the River Kinglas in Argyll with views down the loch. The village is set just off the A83 which is the main route from Glasgow to Inveraray in Argyll and is a quiet village. In the centre of the village is the Stagecoach Inn (2 star inn. Cairndow, Argyll, PA26 8BN - Tel +44 (0)1499 600286) which is one of the oldest coaching inns in Scotland. Visitors include Queen Victoria, who changed horses here in 1875, Dorothy Wordsworth, sister of the famous poet, and the poet John Keats. The Stable Restaurant is built on the location of the original stables. At the south end of the village lies Kilmorich Parish Church which was first built in 1820. The church is one of only two in Scotland to be built in a hexagonal shape and is very picturesque in its surroundings. 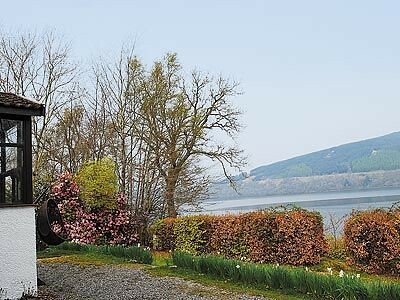 Ardkinglas Estate and Woodland Garden is found at the very south of the village and is home to a remarkable collection of trees and shrubs from various corners of the globe. The garden is home to several "Champion Trees" including the tallest conifer in Britain and is open to the public. There are woodland trails to be explored and visitors can often encounter Red Squirrels whilst walking in the gardens.